Lagunitas is probably dead to a lot of people ever since selling the remaining stake of their company to Heineken last spring. I get it. If you don’t want to drink a beer because of the brewery’s parent company, move along, there’s nothing for you in this article. No hard feelings. 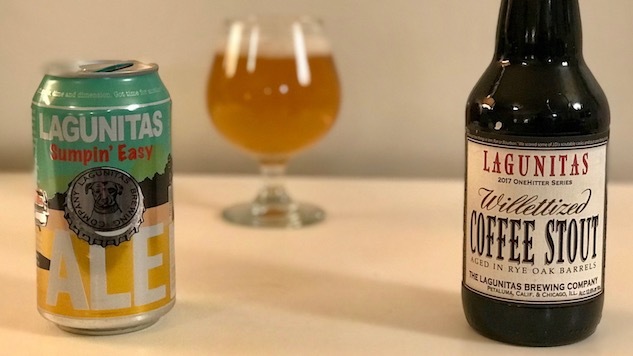 But if you respect the role Lagunitas played in defining craft beer in the ‘90s, and think a brewery can still put out a great beer regardless of who ultimately owns that brewery, then Lagunitas has two new beers you might want to check out. This California-based brewery sends us a lot of new bottles and cans to taste, and honestly, the success rate is hit or miss. The company tries weird things; sometimes those weird things don’t work out, at least in my opinion. But the two latest beers, a pale ale and a barrel aged stout, are both worthy of praise. And that’s saying something, because these particular brews couldn’t be more different. Sumpin’ Easy is a straight forward pale ale that’s joining Lagunitas’ year-round Unlimited Release series as of 2018. I’m not necessarily looking for a new pale ale at this point in my life. I have several that I work into regular rotation, but considering Lagunitas’ was founded in California in the ‘90s, I figure they know a thing or two about hoppy beers, so why not give Sumpin’ Easy the benefit of the doubt. Turns out, Lagunitas still knows how to brew hops. Sumpin’ Easy hinges on Ekuanot Hops, which is a fruity and aromatic weed that delivers an enticing nose to this beer, equal parts herbal and citrusy. The taste is full of grapefruit and peaches and green grapes, wrapped inside a light, pillowy body. Sumpin’ Easy is refreshing and fruity without being too sweet. There’s plenty of bitterness, like you’re getting the full extent of the grapefruit peel, but not bracing in any way. There’s a creaminess to the mouthfeel that contributes to an overall “light and refreshing” beer drinking experience. Sumpin’ Easy was released at the end of December, and will be available year round, but I feel like this beer was designed specifically for summer. You could argue that the world doesn’t need another barrel aged stout, that there are so many of them lining the shelves of your favorite beer shop that one more will just be white noise. It’s a valid point, but my rebuttal would be this: there’s always room for another great beer, no matter how crowded the market for that particular beer style might be. And Willetized Coffee Stout is indeed a great beer. If you’re gonna put beer in a whiskey barrel, you could do worse than a Willett barrel. Willett Family Reserve Rye isn’t a particularly old whiskey, only aged four years, and it’s not one of those bottles you have to stand in line to get. But it’s pretty high proof (110) and really spicy, and full of cherries and black pepper. In other words, it would be a pretty good barrel to deliver solid whiskey characteristics to a beer. I’m not sure how long the beer was aged, but I’m thinking it spent quality time in those barrels, because Willetized Coffee Stout is as much about drinking whiskey as it is about drinking beer. It smells like whiskey and vanilla and a bit of cherry and has a thick, slick mouthfeel, almost like syrup. The whiskey plays a big part in the taste profile as well as the nose, delivering big notes of vanilla and rye right out of the gate. There’s some milk chocolate that mixes into the profile there in the middle, while the coffee comes late to the party, adding a layer of roasted bitterness to the back end of the sip. There’s more carbonation on the back end than I expected. The cherry notes pick up with the carbonation too, giving it a Cherry Coke kind of finish. I was raised in Atlanta in the ‘80s, so like Cherry Coke. There’s some black pepper on the end of the sip too, which sticks with you long after the sip is gone, giving it an unexpectedly dry, spicy finish (much like rye). This beer is thick and rich and decadent. It’s a hell of a barrel aged stout. Does it offer anything new to the incredibly crowded barrel aged stout category? Probably not. Is it incredibly tasty and really fun to drink? Yeah. And like I said, there’s always enough room for another well executed barrel aged stout in my refrigerator. Willetized Coffee Stout is part of Lagunitas’ One Hitter series, so get it while the gettin’s good.